Violet Marguerite Spaid, 84, Plymouth resident since 1963, passed away Wednesday, June 13, 2018, in her residence. Mrs. Spaid was born the daughter of Roscoe Samuel and Deloris Greta (Laffoon) DuVall on August 29, 1933 in Beaver City, Indiana. She was a 1951 graduate of Walkerton High School. She married Richard Neil Spaid on April 15, 1955, at Koontz Lake; he preceded her in death on Feb. 20, 2002. She was a machine operator with Wagner Wire for twenty-five years, retiring in 1989. After retirement she enjoyed spending her winters in Sebring, Fla. Where she made many friends while playing cards, shopping and entertaining. She had been a member of the American Legion ladies’ auxiliary since 1970. 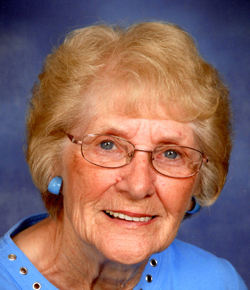 She loved to read and play games with her grandchildren. She enjoyed sitting outside on her porch visiting with her neighbors while living in River Park. Surviving are her two children: Kathy Lynn Alexander and Craig DeMyer, both of Plymouth; Larry Alan Spaid and Marcia Yakim both of Koontz Lake; step-children: Dixie Geddes of Washington; Linda (George) Truhler of Walkerton; and Gary Spaid of Florida. Also surviving are her grandchildren; Jessica Alexander of Plymouth; Cory Hollar, Joely Alexander of Virginia; Christopher Ecker of Indianapolis; Samuel Alexander of Plymouth; Danielle Schaffer of Alaska; and Jennifer Miller of Georgia, two great grandchildren and six step grandchildren. She was preceded in death by her parents, husband, and two brothers; Malcolm Owen and Roscoe James DuVall, and a step son-in-law; Alan Geddes. Visitation for Violet will take place at the Johnson-Danielson Funeral Home 1100 North Michigan Street, Plymouth, on Saturday, June 16, 2018 from 9-11 a.m. and funeral services will follow at 11 a.m.
Burial will be in the Morris Cemetery. Memorial contributions may be directed to either the Center for Hospice, 112 South Center Street, Suit C, Plymouth, IN 46563 or to the Walkerton Historical Society, 413 Michigan Street, Walkerton, Indiana 46574.